The Legend of Zelda is a very famous video game designed by Shigeru Miyamoto and Takashi Tezuka, originally released in Japan in 1986. After 25 years and more than 6 millions copies sold, Nintendo had published in December 2011 a pack of cards to commemorate the 25th anniversary. Each suit is themed after a different game in the Legend of Zelda series. Spade is for the original game and therefore had kept the 8-bit look. 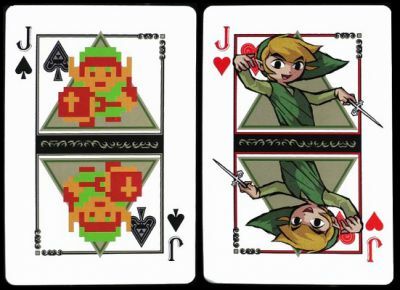 The Jacks and the Queens are always Link (the hero) and Zelda respectively. The Kings and the Jokers are various villains. Each pip card has one suit symbol replaced with something from the game it belongs to. This pack is made in PET (polyethylene terephthalate). Price and where to find: It was only available in Japan for ¥1,050. I found some in eBay and Amazon for US$ 10-25.